Exhibition May 1–May 30, 2014. Opening event Thursday, May 1, 6–9pm. Gallery hours: Tues–Fri, 12-7pm and Sat, 12–5pm. 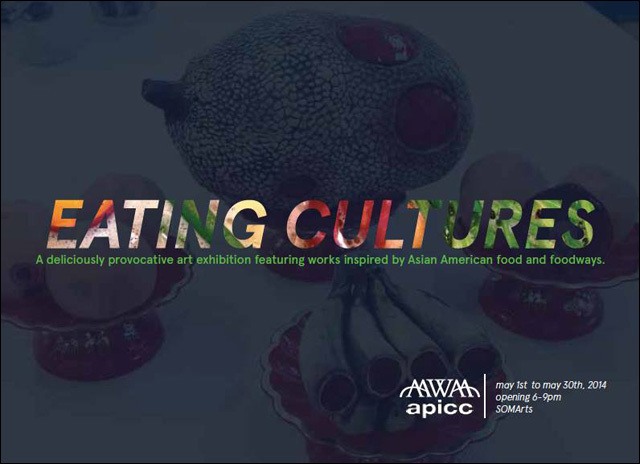 SAN FRANCISCO, CA - Asian American Women Artist Association (AAWAA) and Asian Pacific Islander Cultural Center (APICC) join forces to present the multidisciplinary art exhibition Eating Cultures, for the United States of Asian America Festival opening on May 1, 2014 through May 30, 2014 at SOMArts Cultural Center, 934 Brannan Street, San Francisco. Featuring over thirty emerging and established Asian Pacific American artists from around the country, Eating Cultures is a deliciously provocative multi-disciplinary arts exhibition of artworks inspired by Asian American food and foodways. Using food as a lens, artist share stories of global migration, adaptation, entrepreneurship, and the central importance of food in Asian communities around the world. Eating Cultures is curated by lead curator Michelle A. Lee and co-curators Linda Inson Choy and Cynthia Tom, featuring APA artists of all genders selected by esteemed juror University of Connecticut Art History & Asian American Studies Professor Margo L. Machida. Invited artists include Chinese-American San Francisco-based painter and sculptor Cathy Lu, Vietnamese-Irish American Los Angeles-based artist Genevieve Erin O'Brien, and Korean-American Berlin-based artist Kate Hers Rhee. Admission to the exhibition and programs is free and open to the public. Admission is free. For more information, visit the SOMArts website.